This is a picture of Swiss couple, Martin and Nicole. 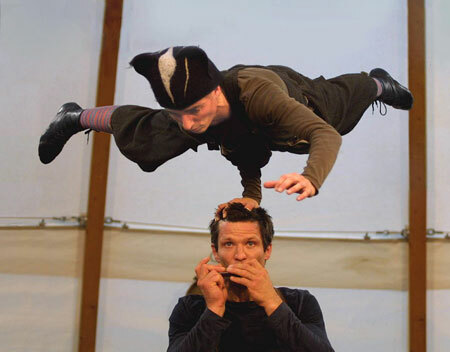 They are – believe it or not – storytellers, albeit storytellers who bring an extraordinary range of acrobatic, clown, and mime skills to their storytelling. I had the great pleasure of seeing them perform The Handless Maiden and The Fisherman and His Wife last weekend at the Welsh International Storytelling Festival: Beyond the Border at St Donat’s Castle in the Vale of Glamorgan. Judging by the standing ovations they received at every performance and the length of the queues to get in to see them, I was not alone in the delight and wonder I felt at their unique brand of storytelling magic. There was much to enjoy during the festival: two and a half day’s of storytelling with somewhere in the region of 50 performers and 120 performances spread over 8 venues. It was an amazingly rich and varied feast of stories with some of the most talented professional storytellers from around the world. There was nothing I saw that was not worth seeing, nothing that was not well-rehearsed and technically proficient, but not everything touched me and I fell to wondering what makes the difference between good storytelling and great storytelling? I think it has something to do with the extent to which storytellers allow themselves to become vulnerable. Miracles of composition, masterfully told, are not to be sneezed at but neither do they guarantee the kind of peak experience that we crave. Unless storytellers are willing to join us in the worlds of the stories they are telling then they are – in a sense – telling their stories at us. When they find the stories in themselves (and themselves in the stories) as, for example, Cat Weatherill did with her magnificent How To Be Glorious and Dan Yashinky did with Talking You In, then we are truly blessed. As storytellers, we do not need to risk life and limb (as do Martin and Nicole) but we do need to risk the heart. At its highest level, storytelling requires courage and generosity of spirit as well as technical accomplishment. It is a lot to ask, particularly of professional tellers who perform night after night, but I believe that really great performances leave neither listener nor teller unscathed. I think you’re absolutely right, Geoff. Being moved is, to me, the most important thing about both storytelling and writing – much more important than technical perfection or performance skills, though obviously they help – and the key is to be moved oneself by one’s own story. I recall seeing Melanie Ray (Canadian storyteller) several years ago at Beyond the Border telling a 3 hour version of Tristan and Isolde and marvelling at how she completely effaced herself so all we saw was the pictures of the story in front of us like a film. I had a similar experience of telling myself yesterday when Elizabeth Scott and I told an inspiring story of courage and sacrifice from the Second World War and at the end people had tears in their eyes, as did I, and even the British Legion bugler and flag bearer who opened and closed the event. I realised afterwards that I had completely lost myself in the story. Incidentally, I am always find your posts moving and illuminating. I remember that performance of Tristan and Isolde by Melanie Ray. It was the highlight of that year’s Beyond the Border for me too! Melanie’s love for all the characters in the story and her own vulnerability were so transparent. And I can imagine just how powerful yours and Elizabeth’s performance was too. Of course, its a fine line between vulnerability and sentimentality – I find some US storytellers in particular seem to play deliberately on the heartstrings in mawkish and manipulative ways that I resent. It just has to be real, unpremeditated, open-hearted, and spontaneous. Not much to ask, eh? I’m very pleased that you are enjoying the blog, Umi. I’m always greatly encouraged by your thoughtful responses. Thank you.